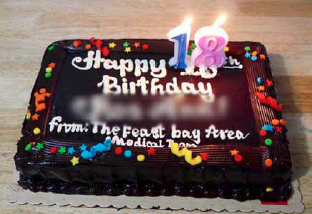 When we learned that Missy (not her real name), one of the girls in Jeremiah 33:6-7 Foundation Inc.’s shelter for victims of sexual abuse, will be celebrating her 18th birthday, the Feast Bay Area Medical Team decided to hold a surprise birthday party for her. We wanted her to feel loved and special on that day. First off, we surprised Missy with a beautiful bouquet of flowers and a birthday cake. We asked some of the girls to give special messages for her during the lighting of 18 candles. Then we held parlor games and introduced some song and dance numbers. She first came to the shelter in May 2014 with her two sisters. She is hearing-impaired and was given a hearing aid by a generous donor during her stay in Jeremiah. As one of the eldest girls in the shelter, she became a dependable big sister not only to her siblings but also to the other girls. Despite her hearing impairment, she managed to finish high school while at the shelter. Presently, Missy is a first year college student taking up Bachelor of Science in Elementary Education and she hopes to finish her college education to support her two younger sisters.